There simply is no stopping Jadon Sancho. The English teenager was on fire yet again for Borussia Dortmund on Matchday 9, netting a first-ever career brace, though BVB were held to a 2-2 draw by Hertha Berlin and saw their lead at the top of the table cut to two points. London-born Sancho put the Hertha defence to the sword with goals in each half on Saturday, first converting smartly from a tight angle when found by Mario Götze and then tapping home after Marco Reus’ superb dummy. Kissing the club badge as he celebrated, he was later replaced by USA international Christian Pulisic on 71 minutes, leaving the field to a standing ovation from the home faithful. "Everyone works hard for each other," he told bundesliga.com after the final whistle. "That's the main thing with this team and if we keep doing this then we have a good chance of winning the league. We just have to keep on working hard for each other and see what happens." 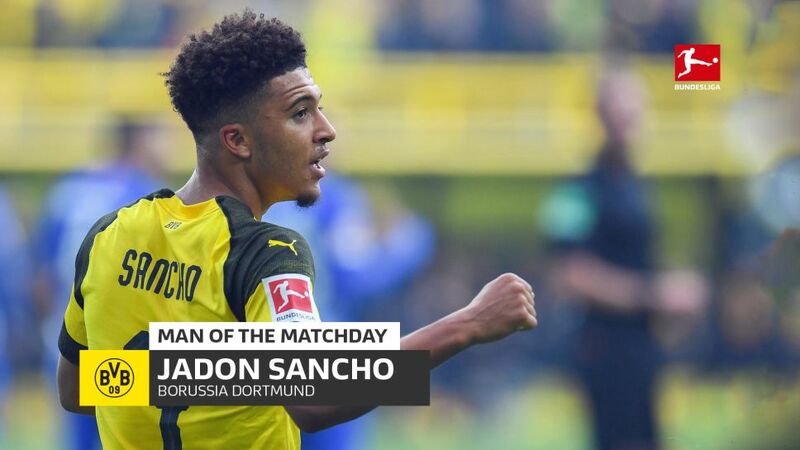 New to the league and in his first campaign as a senior player, Sancho’s performances and stats continue to beggar belief. He has now scored in three matches in a row after netting against Atletico Madrid and VfB Stuttgart, and four of his five competitive goals for Dortmund have come in those three appearances. Even more impressive is that, despite starting just three league matches, Sancho is second in the Bundesliga’s combined goals and assists table, having been involved in ten goals (scored four, assisted six). BVB team-mate Reus also has 10, behind Eintracht Frankfurt’s Sebastien Haller (11). Sancho is also the first player born in the 2000s to score a Bundesliga brace, the youngest player to do so for Dortmund and the eighth-youngest to achieve the feat in the Bundesliga's 55-year history. Quite how high this young man's star can rise is anyone's guess.